DALLAS, Jul 29, 2010 / — Touting “Made in U.S.A.”, two renowned American apparel icons, Levi’s and Brooks Brothers, announcev the launch of a new collection of jeanswear for men, Levi’s® Jeans, Made in the USA for Brooks Brothers. Available at Brooks Brothers stores nationwide, online at www.brooksbrothers.com and in Brooks Brothers catalogs beginning July 29, the collection is the latest in an ongoing series of special collaborations for both brands and re-affirms a shared commitment to products that are “made in America”. Levi’s® Jeans, Made in the USA for Brooks Brothers features a carefully crafted assortment of sophisticated and classic jeans for Brooks Brothers’ customers. Offered in a range of timeless finishes and washes, the line consists of the original and iconic 501® jean, the celebrated 505® jean (the zip-fly “sibling” of the 501® jean) and the modern and streamlined 514(TM) Slim Straight jean. Each of these jeans is crafted in a factory in Los Angeles using imported materials and will retail for $148. 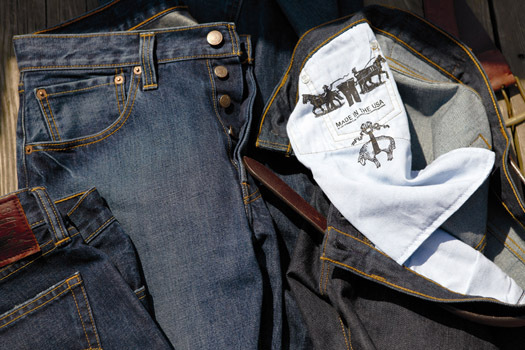 Brooks Brothers collaboration with the Levi’s® brand is a truly natural and authentic fit. Brooks Brothers was a pioneer, introducing America’s earliest ready-to-wear fashion emporium in 1818 just as the invention of the blue jean in 1873 defined the product category, both for the Levi’s® brand and all denim-makers to follow. Since then both companies – driven by a respect for quality and integrity that is embodied in Brooks Brothers’ “Golden Fleece” and in Levi’s® Two Horse® Design – have amassed a long history of serving the needs of pioneering men in the USA and around the world.